Kerala Style Prawn Masala, this is one of the simple prawn masala. Generally, cooking prawn is an easy job as it will not take much time to cook. This recipe will not be too spicy or too bland. Usually, for this recipe, they use only green chilies and no chilli powder. But I have modified the recipe a little as my husband wanted the prawns little spicy this time. So, the version I showed in this recipe will be little spicy. Adjust the spice level according to your preference when you make it. Coriander Powder - 3/4 tsp. Chopped Coriander Leaves - 1 tbsp. a. Clean, de-vein and wash the prawns nicely. b. Thinly slice the onions and slit the green chilies. c. Soak the tamarind in warm water for 15 minutes and prepare the tamarind extract. 2. Take a pan, add cleaned prawns, tamarind extract, half a teaspoon of ginger garlic paste, curry leaves, turmeric powder and slat. Bring this mixture to boil. 3. As soon as the prawn started to cook, it will ooze out more water. Just cook till the prawns are done. Once the prawns are cooked, drain the prawns from excess water and keep it aside. Do not waste the left over water. We will use it for preparing masala. 4. Heat oil in a pan, add sliced onion and green chillies. Saute till the onion turns transparent. 5. Add the remaining ginger garlic paste and saute till the raw smell goes off. Now add the left over tamarind water you reserved for making masala. 6. Mix well and cook till half of the water evaporates. Add in all the masala powders like turmeric powder, chilli powder, coriander powder, garam masala and salt. Mix it well and cook till the raw smell of the masalas vanish. 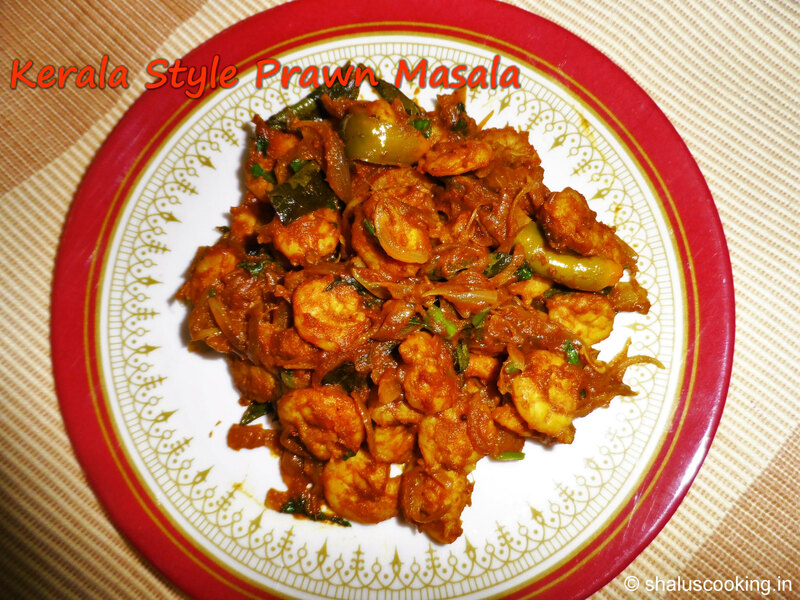 Once the masala become thick, add the cooked prawns. 7. Mix well and saute the prawns in the masala for about 5 minutes on low flame. When done, add the chopped coriander leaves and mix well. 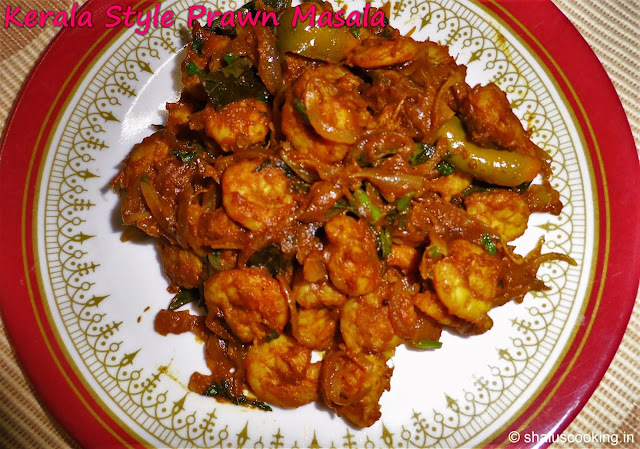 Spicy Kerala Style Prawn Masala is ready to serve. Goes well with rice and chapati. The quantity of prawns (1/2 Kg.) mentioned in the recipe is before cleaning. After cleaning, definitely, the quantity will reduce. I have made this masala little spicy. You can adjust the spice level according to your taste. You can use only green chillies and avoid chilli powder or add less chilli powder. Prawns are rich source of calcium and thus it helps in maintaining healthy bones. Helps in lowering bad cholesterol and aids in maintain our body weight. It is one of the rich source of omega 3 fatty acids which is good for heart health. Proteins in prawns provides good body growth and development.